Did you know that Idaho has the most hot springs of any state in America? With more than 130 usable hot springs to choose from, it’s no wonder that soaking is a popular pastime for locals and visitors alike. Although hot springs can be found all throughout Idaho, the resort town of McCall is close to some of the best. If you’re planning a trip to Valley County, check out these five incredible hot springs near McCall. Located 30 miles south of McCall, the Gold Fork Hot Springs are accessible year-round thanks to a well-maintained (and routinely plowed) road. Gold Fork’s six mineral pools range in temperature from 85 degrees to 110 degrees, and the site includes conveniences such as a yurt for changing, lockers, and a snack bar. There’s also a kiddie pool, making Gold Fork particularly great for families! Gold Fork is closed on Tuesdays for maintenance and does not accept credit or debit cards, so be sure to bring along enough cash to cover everyone in your group. 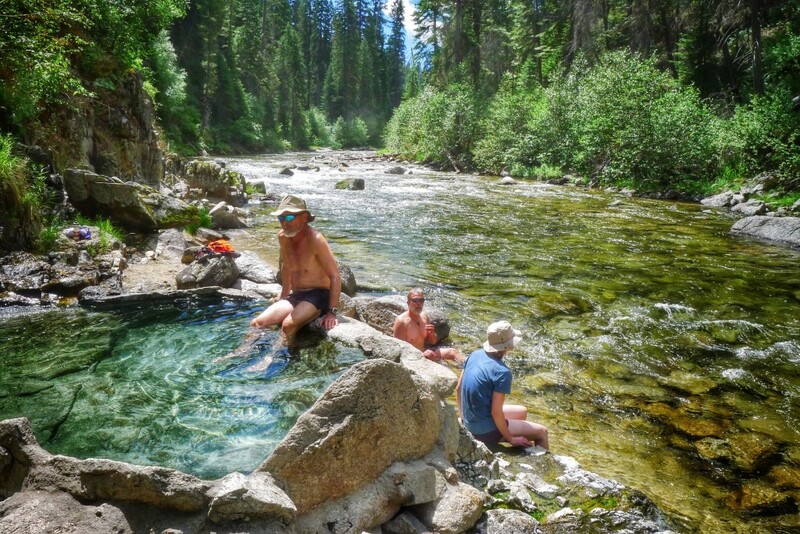 Although not as developed as Gold Fork, the Trail Creek Hot Springs are well known and popular with locals—so get there early if you want to beat the crowds! There are two soaking pools with reinforced walls and valves that can be opened or closed to change the temperature by adjusting the flow of cold water from the river. During the spring, runoff water can submerge the lower pool. Four-wheel drive may also be necessary to access the hot springs during the winter, and Warm Lake Highway itself may be closed during severe winter weather. Located right on the edge of Boise National Forest, Mile-16 Hot Spring is small but scenic. The single pool has a sand and gravel bottom and can comfortably seat four people at shoulder depth. With temperatures consistently hovering between 101 and 107 degrees and gorgeous views of the Salmon River, this hot spring is the perfect place to relax and unwind. The road is paved but narrow, and can be accessed all year, although four-wheel drive and snow chains are required to get through safely during McCall’s infamous extended winters. The pool is also occasionally submerged by spring runoff. After a wall collapse put it briefly out of commission, Loftus Natural Hot Spring has been lovingly restored and remains one of the most popular destinations on this list. Loftus includes two spacious pools—one upper and one lower—which are fed by a waterfall. Both pools have sandy bottoms, and the upper pool is reinforced with mortar. Loftus Natural Hot Spring can be accessed year-round, although the road can be dangerous during the winter. Four-wheel drive and snow chains are recommended, and be sure to check road conditions with the United States Forest Service before departing. The Council Mountain Hot Springs feel more secluded than others on this list, since they’re separated from the road by a forest trail. The hot springs lie at the end of a two-mile hike, making your soak feel like a pleasant reward. The road is only open from May through October or November, and later in the season, after the spring runoff has died down, the hot spring forms a chain of pools with varying temperatures, so you can test them all to find your ideal soaking situation. Although this list is by no means comprehensive, hot springs enthusiasts agree that nothing quite beats the thrill of discovering your own secret soaking oasis. After trying out a few of the hot springs on this list, don’t be surprised if you feel the urge to strike out on your own! But even if you can’t devote the time and energy to exploring new hot spring territory, with so many hot springs near McCall to choose from, you’re guaranteed to find a personal favorite. Featured photo courtesy of Troy Smith. Additional images courtesy of Allison B., Chris O., RideEatCamp, Silenttxa, and Mitchell Friedman.